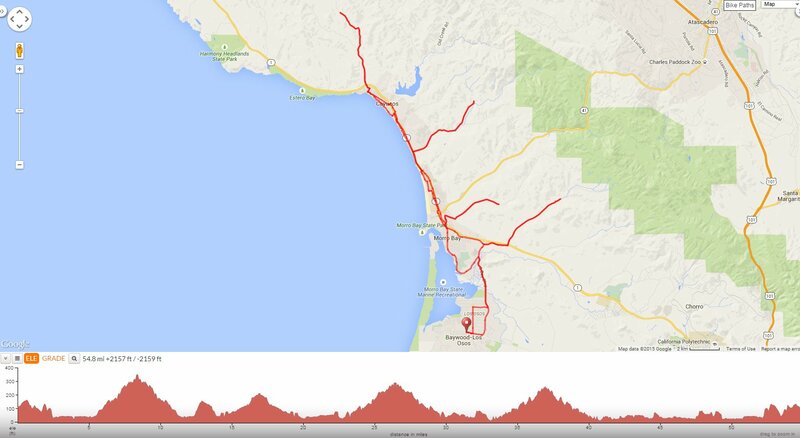 This ride heads north from Los Osos to Morro Bay and Cayucos for the out & back climbs along San Bernardo Creek, Little Morro Creek, Toro Creek and Cayucos Creek. The route returns south on Hwy 1 for a gorgeous run along the coast! Exit Los Osos Community Park and head east through the commercial business district on Los Osos Valley Rd. The left turn on S Bay Blvd leads you up and over the valley along the east edge of town towards Morro Bay with fantastic views of the Morros and Morro Bay Estuary! Turn right and head east on Quintana Rd; this road runs parallel along Hwy 1 with great views of the Morros-Hollister Peak and Cerro Cabrillo! Cross Hwy 1 and continue on San Bernardo Creek Rd; this quiet country back road travels along San Bernardo Creek for 2.9 gentle miles before coming to a dead end at Diethem Ranch. You’ll cut through the open valley farmlands and come across a few ranches and farm houses. Turn around at Diethem Ranch and make your way back to Quintana Rd. Head west on Quintana Rd into Morro Bay; the road takes you pass the town’s industrial area and business center at Cypress Plaza to Main St.
Cross under Hwy 1 and make a quick right on Radcliff Ave and an immediate left on Little Morro Creek Rd. This road turns inland along Little Morro Creek for 2.8 gentle miles before coming to an end at the cattle guard with the No Trespassing sign. The road winds through the agricultural fields and avocado orchards to the open ranch lands and scattered valley homes. Make a U-turn at the cattle guard and descend Little Morro Creek Rd to Main St.
Continue north on Main St; the road runs parallel along the east side of Hwy 1 to Yerba Buena St.
Ride along Hwy 1 N for the next 0.8 mile and enjoy the fabulous coastal views! Turn right onto Toro Creek Rd; this quiet back road travels along Toro Creek for 3.5 gentle miles before coming to a dead end at the ranch gate onto private property. The road heads inland through a small ranching community with farm houses and hay fields. Turn around and make your way back onto Hwy 1-continue north for 1.5 miles to the Studio Dr exit. Make an immediate left onto Ocean Blvd; this road takes you off Hwy 1 for a traffic free stretch along a residential neighborhood followed by a ride through the Cayucos-Morro Bay Cemetery. Cross the little bridge over Old Creek onto Cabrillo Ave and take a left on 13th St; the road leads you underneath Hwy 1 towards Ocean Ave into Cayucos. Hang a right on S Ocean Ave; this wide road takes you through the residential neighborhood out to the beach town’s business district filled with restaurants, shops, galleries and surf shops. Have lunch at any of the food establishments around town or keep it simple with a stop at the local mini-mart. Take a right on Cayucos Dr followed by a left on Birch Ave. The road name changes to Cayucos Creek Rd as you go underneath Hwy 1. Cayucos Creek Rd is a quiet country back road that winds along Cayucos Creek for 3.5 gentle miles; the pavement ends when you reach the ranch house with the white picket fence. Cayucos Creek Rd travels north through the upper valley ranches around the golden hills with views of the avocado orchards and hay fields. Turn around and retrace your steps back to Ocean Blvd. The next few miles through Cayucos takes us along the ocean front homes on Pacific Ave towards N Morro Strand State Beach. Stop at one of the many coastal access points and enjoy the stunningly gorgeous views of the Pacific and Morro Rock! This is a popular spot for kiteboarders too! Get back onto Hwy 1 S for a short 2/10th of an mile and exit at Studio Dr for a roll through another Cayucos beach front neighborhood. Return on Hwy 1 N for 1.3 fabulous miles along the scenic coastline with views of the sandy beaches and Morro Rock! Take the Yerba Buena exit into Morro Bay and stroll through town on Beachcomber Dr to Sandalwood and Coral Ave. Hop onto the multi-use path off Coral Ave and follow the trail through Morro Bay from Cloisters Park to Atascadero Rd, the trail continues south alongside Hwy 1 before exiting onto Main St.
Stay on Main St; the road cuts through the old downtown area of Morro Bay before continuing south into Morro Bay State Park. Main St winds around the park along the golf course, campgrounds and marina before exiting onto S Bay Blvd. S Bay Blvd takes you back towards Los Osos. Enjoy the views of Morro Bay Estuary! At the second traffic signal on El Morro Ave-turn right onto the El Morro Bike Trail; the trail cuts across the Los Osos residential neighborhoods from 18th St to 10th St.
Take Los Osos Valley Rd back to the community park. This is a wonderful Central Coast ride along the quiet country back roads around west San Luis Obispo County! You’ll enjoy the gorgeous ocean bay views and gentle canyon climbs that dangle off the coast like little charms on a bracelet! Weather: Overcast skies with some afternoon sun. Temps ranged from the mid 50’s to the high 60’s with brisk NW winds.